"While I am in agreement with the comments made by Jack in his discussion in the Tuesday Report, I feel that Jack has not covered the issue of exchange money supply. "As in all economies, it is the money supply that governs inflation, consequently it is the same reason that inflation is controlled at a federal level by the raising and lowering of lending rates, to boost or reduce money supply. "An exchange owner must be aware that every time a line of credit is issued, they are increasing the money supply to the exchange and having an effect on the inflationary value of their currency. "Larger, more robust exchanges can afford a higher money supply than smaller exchanges, likewise the U.S. can afford a higher money supply in its real economy than Australia can. However, the average money supply per member must be maintained at a level whereby clients earn sufficiently from free spending, but limited exchange currency inflation occurs. "In addition to Jack's comments regarding supply and demand, I would also like to pinpoint the proliferation of over-charging within an exchange on the devaluation of the exchange currency by over lending and over company spending. "Take the time and calculate the money supply in your exchange, an exchange owner needs to realise that company spending or over lending will result in a large average account balance per client. In this case, no wonder no one wants to accept a particular exchange currency and no wonder over-charging occurs--as clients willingly pay more for goods to offload the currency. "As an exchange owner, do not spend more in your exchange or lend out more than your exchange can absorb." Krista Vardabash, Executive Director of the International Reciprocal Trade Association, has announced that IRTA will be providing attendees at this year's Barter Congress (to be held September 26-29 in St. Pete's Beach, FL) thousands-of-dollars worth in training and ad materials. 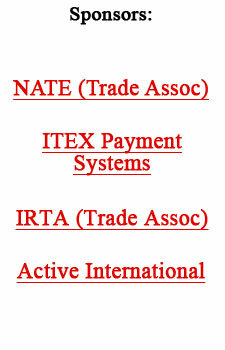 Updated and revised IRTA Barter Sales Manual, sold separately for $1,995. A training video featuring the most effective and experienced sales professionals competing and sharing their techniques before a live audience of judges. Every attendee will be given n ad developed by the IRTA Marketing Committee (a $2,500 value) with space for their own logo, for use in marketing efforts in their business area. For more information go to www.IRTA.com. The reading of this edition, which was published less than two years ago, shows the enormous change that has occurred in the barter marketplace. We reported on Big Vine's merger (really the exit from the barter business) with All Business.com. When reading the story what jumps out is the incredible amount of money that was being thrown around in those heady dot-com days. Also noted was Exchangemall's launch at the Hollywood Palladium, BarterNet's option agreements with three Australian affiliations, and Oxygen Media's bartering 30% of its company to strategic investors. Malaysia has told the world's arms sellers (major weapons suppliers) that partial payment for any products purchased must be in palm oil--up to 50%. Malaysia is the world's largest producer of palm oil. Such a move enables the country to maintain its valuable foreign exchange. On another front, India is seeking approval from the United Nations Sanctions Committee to import 5 million metric tons of crude oil from Iraq under the U.N.'s oil-for-food program. India will pay for the oil with wheat in this bilateral barter deal. Small public companies as well as small firms in the accounting industry are going to pay the price for the mistakes of the big business executives and their auditors...as the blanket legislative approach to the corporate accounting scandals have overshot the mark, according to small business advocates. The added cost and management of hiring various accounting firms for accounting, auditing, tax filing, financial reporting and other consultation services places a disproportionate burden on small firms. Furthermore, there will be an incentive to stay private, which then robs the country of its competitiveness and investment opportunities. Chief Economist Raymond Keating of the Small Business Survival Committee says, "many in the media and in government wrongly assume that the market just wants to see the federal government do something, with the details not being all that important. But in a legitimate effort to stop lawbreakers, federal legislation unfortunately overshot the mark by imposing new costs on many small firms." Government statistics Friday showed that industrial productivity, the key to rising living standards, increased 1.1% in the second quarter, a slower rate of gain than earlier this year, or in recent years. But productivity gains of 4.7% in the last twelve months are the best gains achieved (more output achieved and wages earned without inflation) since 1983! Barter-bay.com, an online trade company, is changing its service fee structure from cash to 100% trade. (Barter company administrators as third-party record-keepers, typically charge a cash service fee to their members for each barter transaction.) Several other online barter companies around the globe are operating in a similar manner. Is this business model workable online? Unfortunately, such theories and experiments (despite being well-intended) do have consequences...if they fail. The losers are those who sold their products or services into the network, and are left holding trade dollars when a barter company goes down for the count. In the 70s several national franchise organizations in the U.S. operated in this manner. They saw themselves as "barter purists," believing that cash simply wasn't needed---all service fees were payable in trade. By the to mid-80s, however, they all faced considerable financial challenges, and shortly thereafter ceased operations. One of the most desired clients within a trade exchange is a restaurant. The September issue of The Competitive Edge shows why restaurateurs in your community need the services of a trade exchange. The article includes pie charts showing costs for full service and limited service restaurants. Powerful material for your sales efforts. So, check out the hottest marketing tool in the industry...click here! The Internet continues to put downward pressure on hotel rooms, according to a report by Bear Stearns. They predict that online booking of hotel rooms will grow to $15.5 billion in 2006, from $3.8 billion in 2000. And most of this growth will go to third-party travel web sites rather than the proprietary sites run by hotel companies. Bottomline: The Internet has empowered the consumer, enabling them to compare rates in a matter of minutes, rather than what had historically been a much longer period of time. Similarly, the Small Business Administration says the delinquency rate for its business-loan programs remains high--with 7.9% of loans outstanding being delinquent. Do you want to dine out at some of the finest restaurants in your area? If you trade exchange doesn't have them as members there is another way to acquire great meals at 50 to 60 cents on the dollar...we tell you who to become friends with to accomplish this on page 65 of FastStart Program I. Clause covering conditions that must be met to make the contract valid. Cost per thousand. Refers to the cost of purchasing one thousand "views" from a specific demographic on a media buy.